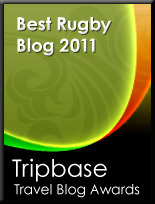 TOTAL FLANKER...a rugby blog: Whatever happened to: the Forward Pass? What is, and what is not, a forward pass? To me the answer is simple. If a pass looks forward then, in all likelihood, it is forward. That certainly used to be the case. 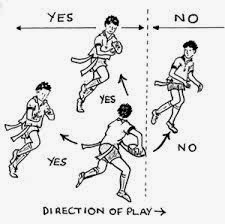 After all, rugby's Law 12 seems simple enough. “"A throw forward occurs when a player throws or passes the ball forward." Apparently it is no longer enough to see that a pass is forward - the naked eye is no longer to be trusted. No, these days we appear to require a degree in physics before we can make such a complex call. Newton's law of motion, I am reliably informed, says that “an object in motion stays in motion with the same speed and in the same direction unless acted upon by an unbalanced force." In other words, to put Newton into some sort of rugby context, when deciding if a pass is forward we now need to take into account the momentum of the passing player. Giving the benefit of the doubt to the attacking team is all very well, but even those who know next to nothing about rugby tend to be aware that a fundamental part of the game is that the ball cannot be passed forward. How ludicrous does it look, then, when you, I and millions watching on TV can see that a pass is blatantly forward only for the officials to decide otherwise, even after reviewing several replays which appear to confirm what we all saw in the first place? Sadly for England rugby fans, even the officials at the Stade de France last week had to agree that Pascal Pape's last gasp pass last Saturday evening was so far forward that Damien Chouly caught the ball on Sunday morning. Labels: forward pass, rugby, Whatever happened to?